Prevalence of abdominal aortic aneurysm: Much more common in females (9:1), 4% of men aged 65 (increasing with age). 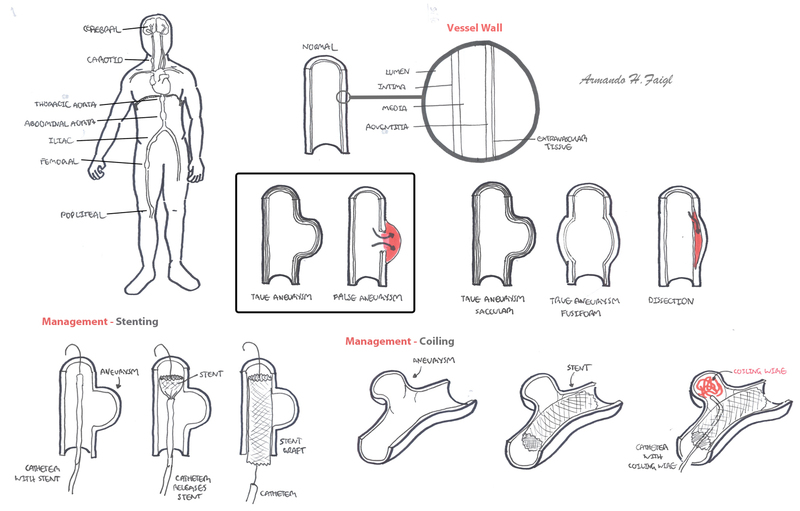 Anatomy Layers of the vessel, from the inside, the tunica intima, media and adventitia. Surrounding the vessel is extravascular tissue. 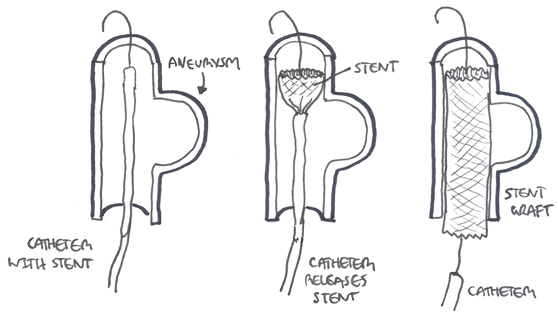 True Aneurysms is dilatation of the vessel wall involving all layers, where as false is dilatation of the vessel due to the leakage of blood through the wall but is contained by the adventitia or surrounding perivascular soft tissue. Aneurysm: an artery that has enlarged to greater than 1.5 times the expected diameter. 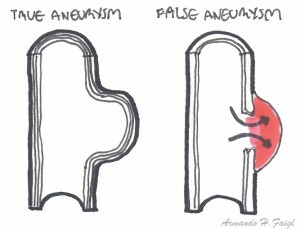 True Aneurysm: The aneurysm is bound by all three layers of the vessel wall (intima, media and adventitia). The wall may be attenuated. 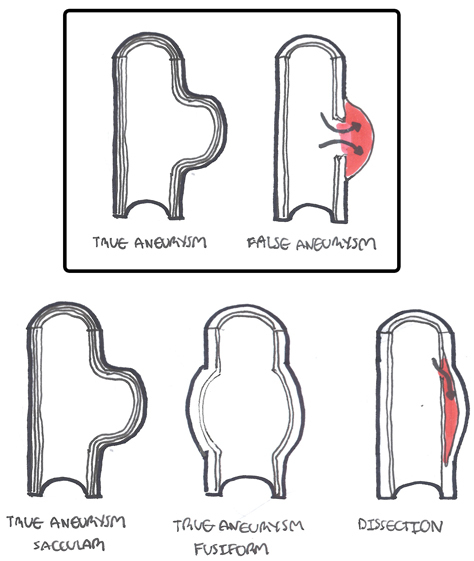 False Aneurysm: Occurs when a blood vessel wall is injured, and the blood is contained by the surrounding tissues creating an apparent dilatation of vessel. Aortic dissection: occurs when a tear in the tunica intima of the aorta causes blood to flow between the layers of the wall of the aorta, forcing the layers apart. Sites of Aneurysm The aorta (infrarenal) is the most common. Iliac, femoral and popliteal arteries are the next most common. 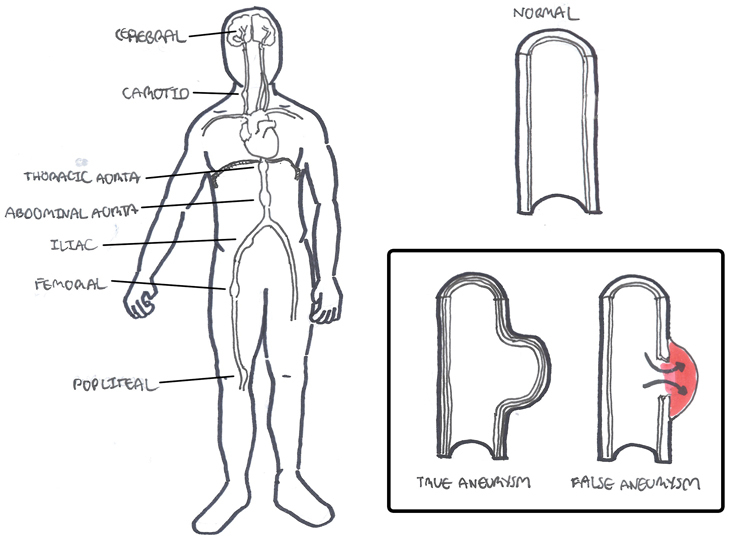 Types of Aneurysm True Aneurysm is abnormal dilatations that involve all the layers of the vessel wall. 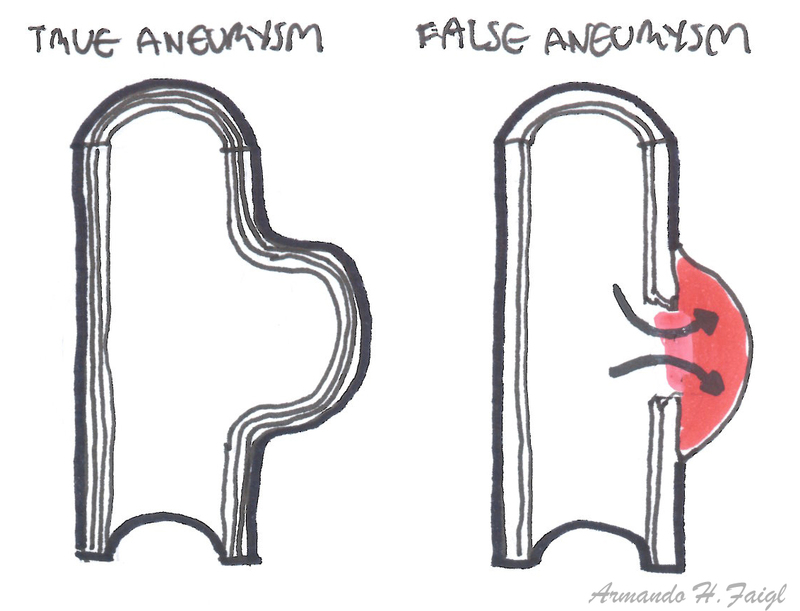 False Aneurysms (pesudoaneurysm) involve a collection of blood in the outer layer only (adventitia) which communicates with the lumen. Aneurysms can be saccular (dilatation on one side) or fusiform (both sides) which is common in AAA. Classic ruptured AAA triad: Hypotension/collapse, back/abdominal pain, Palpable/pulsatile abdominal mass. Often asymptomatic. ~40% are incidental findings (clinical examination, ultrasound, abdominal x-ray). Most common site is aneurysm below the renal arteries. 15% extend down to involve the origins of the common iliac arteries. AAA is associated with other peripheral aneurysm (popliteal). Risk of rupture and mortality increase with the diameter of the aneurysm. Remember Classic triad of ruptured AAA congenital: Hypotension/collapse, back/abdominal pain, Palpable/pulsatile abdominal mass. Robinson, D., Mees, B., Verhagen, H., & Chuen, J. (2013). Aortic aneurysms Screening, surveillance and referral. RACGP. 42 (6). 365-369.